Second verse, same as the first! LOL Yes, this is a second version of the card I CASEd yesterday. 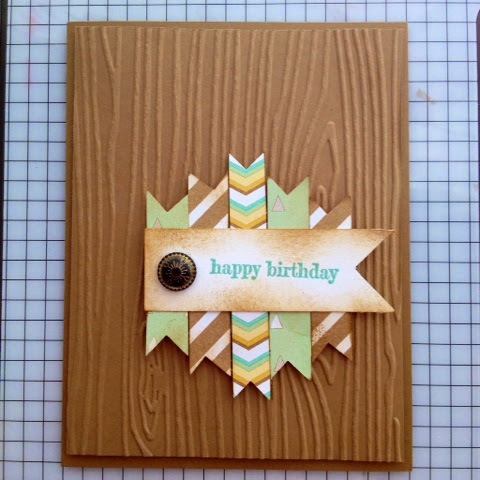 But I tried the Lullaby Designer Series Paper with the Wood Grain Textured Impression Embossing Folder. This time, the colors are Baked Brown Sugar and Coastal Cabana, sponging again on the edges of the pennants and banner. This DSP almost doesn't say masculine to me, but its fairly guy-ish. If you want to try this card layout, the dimensions I used are for an A2 card. Embossed Layer - 4 x 5.25"
Banner - 3" x 1"
I like this layout because it has texture, and its festive with the pennants and the banner, and its kind of a simple Wow. I will say the color coordination is key, not all colors work in this layout - trust me, I've tried! But once you find that color combo that works, its pretty satisfying! REMINDER: Paper Pumpkin sign ups are due by the 10th! You can still take advantage of the 50% Off your first TWO months, but only if you become a member by Wednesday 9/10! !